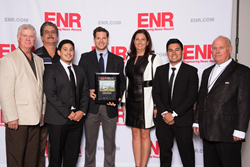 Gilbane Building Company was recently honored by ENR Texas & Louisiana with the Best Renovation/Restoration Project award for the Moody Gardens Aquarium project located in Galveston, Texas. The award ceremony took place in Houston on October 18, 2017. Gilbane is no stranger to unique, challenging projects and the Aquarium renovation project at Moody Gardens fit the bill. Not only did the aquarium need to remain open to accommodate tourists, it also had to remain accessible 24-7 to operations staff for animal care. The project was completed over 2 years and included 9 phases. The $37 million renovation was the first renovation of the building since they opened in 1999 and this project added new life into this already impressive facility. The addition of new exhibits, new flooring, lighting, as well as improvements to the life support systems complimented the facility while providing improved function. The renovations were complete in April of 2017, two months ahead of schedule. “Gilbane is honored to have a long, successful relationship with a client like Moody Gardens. You do not always get the opportunity to renovate a building that your company built over 20 years ago. To leverage our in-house resources and work with a team of people that are like a family, is a priceless opportunity that I am proud some of our younger employees got to experience,” stated Angela Cotie, Project Executive for Gilbane.